Indie Retro News: Scare Bear +4DGH - Toy bear in motorway killing spree! Scare Bear +4DGH - Toy bear in motorway killing spree! The only limitations games had back in the 8 bit era, were the fertile imaginations of the sometimes utterly bonkers game developers... And that's why games like this one on the Commodore 64 got commercial releases. 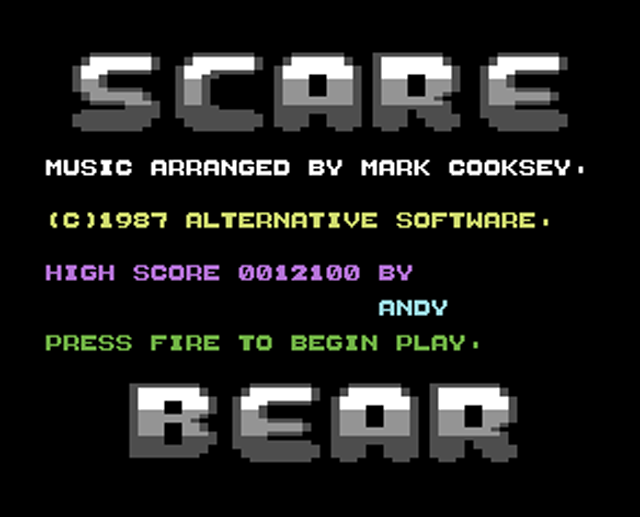 1987 Alternative Software's Scare Bear features Freddy Bear, who has fallen asleep hungry for a cheese sandwich, and found himself in a dream... Speeding along the motorway being attacked by toy robots, worms, airships and many other deadly toys and only his fast car and a pot of auto refilling nuclear honey to stop them with. Hokuto Force have rescued yet another of gaming's underdogs from obscurity with this brand new release on the CSDb. So how about the game? 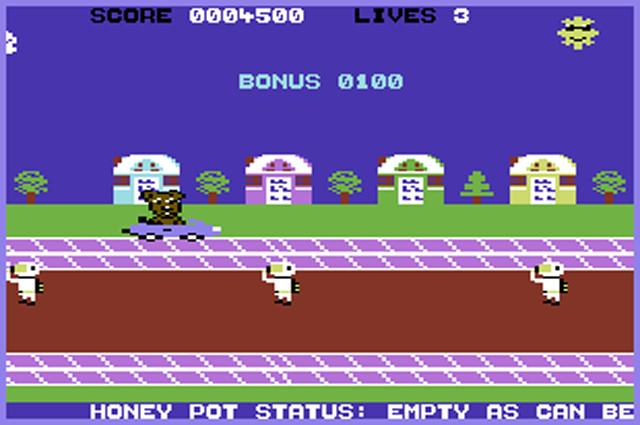 You control Freddy in his car and try to avoid the toys by jumping over them as they come towards you, and if your honey pot is full, you're able to increase your score by hitting them with it by pressing fire and a direction. If you crash the car into the toys, which seems to happen often and unavoidably sometimes, you'll lose some bonus points, which double up as your health bar, if it reaches 0 then the next hit will kill you and you'll lose a life. Each level end will see your bonus replenished and the enemies replaced with different types of toy, and difficulty is increased by varying their attack patterns. And that's it, it couldn't be simpler, and for kids I can see this game being a lot of fun. Although serious gamers might be put off by the repetitive gameplay and slightly sluggish jumping and firing controls. Bear (ahaha) with this game and you'll find some rather nice features: Firstly a fantastic title screen has been added, which really shows off the cutesy nature of the game. The sprites are drawn nicely, especially the bear and enemies. Also there's some cool robotic noises in the in game music written by Mark Cooksey, legend of Ghosts & Goblins, Ikari Warriors, Bomb Jack, Space Harrier fame. And a handy trainer lets you increase your fire rate by filling your honey pot faster, a mechanic which feels more like a fix, than a cheat.